Background The Claim Evaluation Tools database contains multiple-choice items for measuring people’s ability to apply the key concepts they need to know to be able to assess treatment claims. We assessed items from the database using Rasch analysis to develop an outcome measure to be used in two randomised trials in Uganda. Rasch analysis is a form of psychometric testing relying on Item Response Theory. It is a dynamic way of developing outcome measures that are valid and reliable. Objectives To assess the validity, reliability and responsiveness of 88 items addressing 22 key concepts using Rasch analysis. Participants We administrated four sets of multiple-choice items in English to 1114 people in Uganda and Norway, of which 685 were children and 429 were adults (including 171 health professionals). We scored all items dichotomously. We explored summary and individual fit statistics using the RUMM2030 analysis package. We used SPSS to perform distractor analysis. Results Most items conformed well to the Rasch model, but some items needed revision. Overall, the four item sets had satisfactory reliability. We did not identify significant response dependence between any pairs of items and, overall, the magnitude of multidimensionality in the data was acceptable. The items had a high level of difficulty. Conclusion Most of the items conformed well to the Rasch model’s expectations. Following revision of some items, we concluded that most of the items were suitable for use in an outcome measure for evaluating the ability of children or adults to assess treatment claims. To our knowledge, this is the first Rasch analysis of multiple-choice items that measure people’s ability to assess claims about treatment effects. We have used robust methods to evaluate the items’ validity and reliability in two settings, allowing for evidence informed revisions. Our analyses suggest that most items have acceptable model fit and can be used in the settings where they were tested. The items might function differently when translated or used in other settings. The first step in the IHC project was to identify the Key Concepts people need to know to be able to assess treatment effects.22 This resulted in an initial list of 32 Key Concepts that serves as a syllabus for designing learning resources.22 This was also the starting point for the IHC learning resources. We present a short list of the Key Concepts in box 1. This list is hosted by testingtreatments.org and is an evolving document subject to annual revisions. piloting and practical administrative tests of the items in different contexts. Example of a multiple choice-item taken from the Claim Evaluation Tools database. To assess the validity, reliability and responsiveness of multiple-choice items from the Claim Evaluation Tools database, using Rasch analysis, in English-speaking populations in Uganda and Norway. We also included a group of children who had participated in a pilot of the IHC primary school resources at an international school in Norway. Although this was a small sample, it provided an indication of the fit to the Rasch model in an international population and provided information on difficulty and DIF in the two different settings. We evaluated 88 items addressing the 22 Key Concepts initially targeted by two IHC interventions.26 27 Having multiple items for each concept allows us to delete items with poor fit to the Rasch model. In addition, Rasch analysis provides information on each item’s difficulty. Having a range of items with different difficulties addressing each Key Concept can be useful for measurement purposes, for example when used in Computer Adaptive Testing. There is no consensus on the sample size needed to perform a Rasch analysis.28 This is a pragmatic judgement that takes account of the number of items evaluated and the statistical power needed to identify item bias resulting from relevant background factors. Since we intended to test many items, we did not consider it feasible to include these in a single test and split the items into four sets or ‘tests’. We aimed to include approximately 250 respondents in Uganda for each of the four tests. The children in Norway only responded to one set (out of the four). In both settings, we administered the items in English, since this was the official school language in both the Norwegian international school and the Ugandan schools. The data collection took place in 2015. In developing the Claim Evaluation Tools database, low literacy skills were identified as a potential barrier in the Ugandan setting.23 Consequently, we developed four items to evaluate the respondents’ text recognition and understanding as an indication of their reading ability (see online supplementary appendix 1). We tested these items using the Lexile Analyser, and the items were found to fit within typical reading measures for fifth graders.29 We designed the items to resemble the multiple-choice items addressing the Key Concepts. The first two items required the respondents to identify the correct text in the scenario. The latter two items assessed whether the respondent understood the information in the scenario. In Rasch analysis, the response patterns to an item set are tested against what is expected by the model, that is, the ratio between any two items should be constant across different ability groups.31 For this study, ability refers to the ‘ability to critically assess claims about treatment effects’. In other words, the easier the item is, the more likely it will be answered correctly, and the more able the person is, the more likely he or she will answer correctly.35 We explored this relationship between the expected and observed data using the summary statistics function in RUMM2030. The overall Item–Person Interaction is presented on a logit scale, and in RUMM2030 the mean item location is always given as a zero. A mean person location higher than ‘0’ indicates that on average, the test is ‘too easy’ and that the response group has a higher ability than the difficult level of the test. A mean person location lower than ‘0’ suggests the test is ‘too hard’. The Item-Trait- Interaction in RUMM2030 is a test of invariance to the scale, and whether or not the data fit the model for the discreet ability groups.37 Ideally, the χ2 probability value should be greater than 0.05, indicating that there is no ‘statistically significant’ deviation between the observed data and what is expected form the model. We investigated individual person fit. Misfit violates the principles of the Guttman structure and may indicate different types of error, such as guessing. The item characteristic curve indicates the theoretically expected probability of answering correctly as a function of ability on the latent trait scale (see figure 2 for an example of an item characteristic curve). We inspected item characteristic curves and used χ2 values as single item fit indices using a 0.05 as our significance level. Using Bonferroni adjustment, the significance level was adjusted (p=0.05/k) according to the number of k significance tests carried out (one for each item). We also performed distractor analysis using SPSS. This is particularly useful when developing and revising multiple-choice items, because it may identify response options that are not working as intended and can subsequently be deleted or revised. We explored DIF for setting and age using analysis of variance in RUMM2030. We also explored DIF by reading ability. This was done by pragmatically categorising the responses to the four reading ability items into two groups (merging respondents with 0, 1 or 2 correct responses and those with 3 or 4 correct responses). Unidimensionality—having just one trait underlying responses—is a fundamental requirement of measurement and is explored using Rasch analysis.35 Furthermore, there should be no response dependency in the data; that is, people’s responses to an item should not have a bearing on their responses to other items.39 Response dependence results in redundancy in the data and inefficient measures. The total sample included 1114 people, among whom 685 were children and 429 were adults (including 171 health professionals). Of these 1114 people, 329 had received some form of training related to the Key Concepts. The Norwegian sample equalled 5% (59 respondents) out of the total respondents. The mean number of missing and incorrectly filled in responses was <1% per item set. Less than 1/3 responded correctly to all four reading test questions in the Ugandan sample. Overall, the items were difficult with no very easy items and no extremely difficult items (see figure 2 for the item threshold distributions per set). The mean person locations per set were −0.81, –1.06, −1.15 and −1.15 logits, respectively. Fit Statistics are presented in table 1. Mean item fit residuals and person fit residuals were satisfactory and close to 0, although the standard errors for set 1 and 2 is somewhat higher than what we would like to see. The Item–Person maps for all sets are available in figures 3–6. The upper part of the Item–Person map represents respondents’ ability levels; the lower part show the distribution of item locations. From this we can see that, overall, the tests are difficult. This suggests that easier items might be needed to make these tests more sensitive (able to separate between people at the lower end of the scale (those with lower ability).36 The χ2 probability was 0.00 for all sets, indicating that not all items may work as expected. Item–Person map for item set 1. Item–Person map for item set 2. Item–Person map for item set 3. Item–Person map for item set 4. The estimated reliability indices were acceptable (Cronbach’s alpha >0.70 for all sets with exception of set 4 where the value was 0.63). Similarly, the Person-Separation Indexes were satisfactory for all sets with the exception of set 4, which had a value of 0.54. We identified few persons with misfit. Likewise, we identified only two items with potential misfit in set 1, and one item in the remaining three sets (see table 1). Overall, most items fit well to the Rasch model. However, out of the 88 items, 17 items were found to have poor model fit. The findings resulting from the distractor analyses also suggested that many of the items would be improved by deleting or revising response options. In set 1 (the only set applied in both Uganda and Norway), five items displayed uniform DIF and one item displayed non-uniform DIF associated with setting (ie, Norway and Uganda). Across the four sets including 88 items, six items displayed uniform DIF associated with age and seven items indicated DIF associated with reading ability. We did not observe any statistically significant residual correlation between pairs of items, and the paired t-test procedure indicated that the sets were sufficiently unidimensional (table 1). We have developed the Claim Evaluation Tools database using qualitative and quantitative feedback from methodologists and end-users in six countries.23 This study reports the findings of the first psychometric testing of multiple-choice items from the database, using Rasch analysis conducted in two settings—Uganda and Norway. Most of the 88 items (addressing 22 Key Concepts) conformed well to the Rasch model. However, some items displayed DIF and required revisions. Overall, we found that the four item sets created from the Claim Evaluation Tools database had acceptable reliability. We did not identify significant response dependence between any pairs of items and, the magnitude of multidimensionality in the data was acceptable. On the basis of the findings from previously reported descriptive and qualitative methods, experts and end-users suggested that the items were potentially difficult for members in our target group.23 The Rasch analyses confirmed this. Furthermore, using the reading items we developed, the respondents reading skills were found to be low. Using these items, we also explored DIF by reading ability. 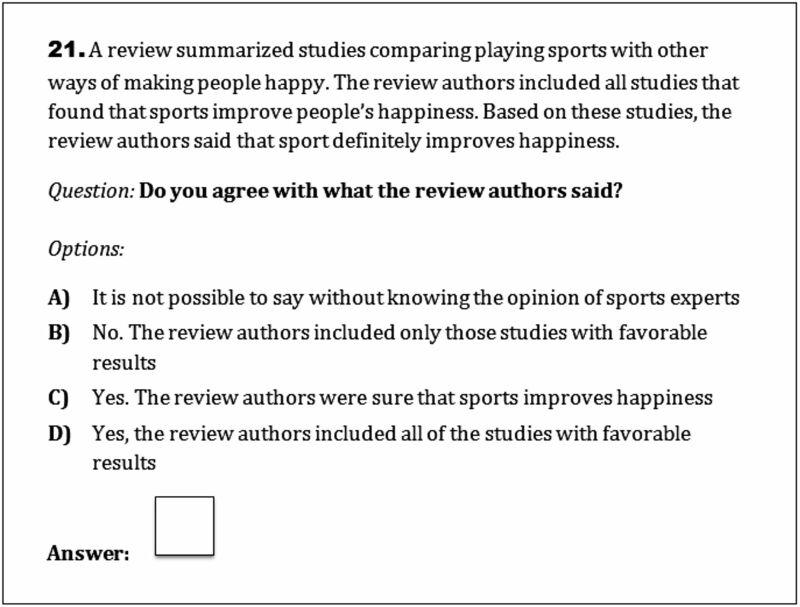 It should be noted that the results of this analysis should be interpreted with caution since these items have not previously been tested, and only served as a pragmatic indicator of the respondents’ ability to identify and apply the correct text in response to questions relating to a scenario similar to what we use in the multiple-choice items. Only 7 out of 88 items displayed evidence of DIF, suggesting that most items work in the same way independent of people’s reading ability as measured in this study. This suggests that efforts should be made to simplify the text in the scenarios and editing the response options to improve readability and improve validity. Reducing the number of response options in the items could also contribute to making the items less difficult. Based on the findings from our analyses, we decided to remove items with non-uniform DIF from the Claim Evaluation Tools database. We also decided to revise items with poor model fit and reduce response options that did not work as expected. Revised items will be retested in the Ugandan context, where they will be used as an outcome measure. A limitation of this study is that we tested the items in only two settings, Uganda and Norway, and that the fit to the Rasch model in other settings is unknown. Further testing of items from the Claim Evaluation Tools database using Rasch analysis in other countries and languages is needed. We also did not include the respondents’ gender in the analysis, which could introduce further DIF. This will be explored in further testing. There has been an encouraging interest in the Claim Evaluation Tools database in settings other than the countries included in the IHC project, and researchers in Norway, Mexico, Germany and China are currently translating and testing the multiple-choice items in their settings. In addition, the items addressing the Key Concepts we judged to be more advanced, and which were not tested as part of this study, are currently being tested online through www.testingtreatments.org, targeting people with relevant training, such as health researchers or teachers of evidence-based medicine. We are also developing items to assess intended behaviours and attitudes towards assessing treatment claims. The Claim Evaluation Tools database, which includes all of these questions, as well as findings from evaluations such as this one, is freely available for non-commercial use on request through the Testing Treatments interactive website (www.testingtreatments.org). We found that most items that we tested had satisfactory fit to the Rasch model. Taken together with our previously reported findings, the findings of this study suggest that the items have face and construct validity in the settings in which they have been tested. Following revisions of some items, informed by the findings from this study, most of the items that we tested are suitable for use in an outcome measure that evaluates people’s ability to apply the key concepts they need to know to be able to assess treatment claims. We are deeply grateful to all of the enthusiastic children, parents and teachers who contributed to this project. We would also like to thank the IHC advisory panel, and the other researchers and methodologists who provided their advice in the development process.
. 2005. Lay public's understanding of equipoise and randomisation in randomised controlled trials. Research Support, Non-U.S. Gov't. NHS R&D HTA Programme. Report No: 1366-5278 (Linking) . Contract No: 8.
. Testing treatments: better research for better healthcare. 2nd edition. London: Pinter & Martin Ltd, 2011. www.testingtreatments.org/new-edition/.
. Promoting informed healthcare choices by helping people assess treatment claims. BMJ 2016.
. Decision aids for people facing health treatment or screening decisions. Cochrane Database Syst Rev 2014;1:CD001431. Issue 1 Art No: CD001431.
. Strategies for teaching students to think critically: a Meta-Analysis. Rev Edu Res 2015;85:275–314.
. Evaluation of resources to teach children in low income countries to assess claims about treatment effects. protocol for a randomized trial. 2016.
. Measuring ability to assess claims about treatment effects: the development of the “Claim Evaluation Tools”. BMJ open 2016.
. Constructing written test questions for the basic and clinical sciences. 3rd edition. Philadelphia: USA, 2002.
. Sample size and item calibration stability. Rasch Measurement Transactions 1994;7:328. Lexile-to-Grade Correspondence. MetaMetrics. 2017 https://www.lexile.com/about-lexile/grade-equivalent/grade-equivalent-chart/. Rasch analysis. 2016 http://www.rasch-analysis.com/ (accessed 2016). Psylab Group. Introductory Rasch Analysis Using RUMM2030. The section of rehabilitation medicine. Leeds, UK: University of Leeds, 2016. Displaying the RUMM2030 analysis. Rasch unidimensional measurement model, 2015.
. Formalizing dimension and response violations of local independence in the unidimensional rasch model. J Appl Meas 2008;9:200–15. RUMM. Extending the RUMM2030 analysis. 7. ed. Duncraig, WA: RUMM Laboratory Pty Ltd, 2009.
. Passing scores; A manual for setting standards of performance on educational and occupational tests. Princeton, NJ: Educational Testing Service, 1982.
. Scales, norms, and equivalent scores. In: Thorndike RL, ed. Educational measurement. Washington DC, 1971:514–5.
. Measuring ability to assess claims about treatment effects: establishment of a standard for passing and mastery. IHC working paper 2017. ISBN 978-82-8082-802-6. Contributors AA, ØG and AO wrote the protocol, and the IHC Group provided comments to this protocol. The Claim Evaluation Tools were developed by the IHC Group. AA coordinated all of the development and evaluation process with support from AO. DS, AN and KO performed the data collection and data entry from the field testing. ØG and AA prepared the data files for the analysis, and ØG conducted the Rasch analysis. AA authored this manuscript with significant input from the IHC Group. Funding The IHC project is funded by the Research Council of Norway-GLOBVAC project 220603. Ethics approval The research was approved by the Makerere University School of Medicine Research and Ethics Committee and the Uganda National Council for Science and Technology. Data sharing statement All data are published as part of this study; additional information is available upon request and on our website informedhealthchoices.org. All items in the Claim Evaluation Tools Database are available upon request for non-commercial use.